Specific Industry: Hellenic Australian Business Council, non-profit organisation connecting partners & supporting bilateral business, trade exports/imports & investment opportunities in Australia & Greece. Complete website solution, including initial consulting, online business strategy, web design concept, programming development with extensive elements of Content Management System (CMS) for updating content, market content research & writing, editing, SEO analysis and implementation, online and Internet marketing business strategy and presence, tracking & monitoring, and hosting service. Logo was also created in collaboration with the HABC and a graphics designer. The entire website was constructed in the English languages and will be fully translated to Greek. The Hellenic Australian Business Council (HABC) was established in 2012 as a not-for-profit organisation registered in Greece as an association. It is a non-governmental, non-political association governed by a Board of Directors elected by Members. Corporate membership and event sponsorship is the sole source of funding for the Business Council. Its mission is to connect partners & support bilateral business relations between Greece and Australia, including trade exports/imports & investment opportunities in both markets, whilst offering added value market information, news and specialised events. Focus for this project was to deliver a functional, professional and efficient web platform for promoting the Hellenic Australian Business Council and the services it provides. Overall, the website had to be informative, easy to navigate and achieve good web presence and search engine ranking in order to reach out to a larger audience and boost its ability to create new partnerships. Most importantly, all this had to be in line with the association's strategy, whilst remaining consistent with other governmental structures in Australia and Greece. As an organisation, the HABC was only freshly launched, thus the website would prove to be fundamental in its development, growth and success. Crucial elements of the site were in the static content in order to achieve a reasonable ranking, as well as the CMS to provide the option of regular postings of new relevant content and offer members and new visitors added value information. This project followed now standard procedures for the Web Conceptions team. First, brainstorming with the client in order to clearly understand their missions and guidelines. Then, set the project's scene and an overall perspective and concept. With this came extensive research of the business, trade and investments sectors in both Greece and Australia, and benchmarking other governmental and organisational structures. When all preliminary groundwork was done, Web-Conceptions presented the client with a number of website base structures and what possibilities could be achieved. Together they chose the most suitable design and worked closely together to produce final results. Content and SEO: when it comes to search engine optimisation, it is well known that content is King. This site needed to have a good amount of relevant content that was not only informative, but also suited SEO purposes, i.e. revolving around key words. Of course prior to doing this, a thorough analysis had to be conducted on what key words and phrases relevant markets (in this case mainly Greece and Australia) normally search (in Google, Yahoo, Bing and other major search engines) when seeking information, direction and services on bilateral business, trade and investments in Greece and Australia. No doubt, this is a highly competitive field, therefore content had to be quite specific, and backed by other SEO strategies, such as social media, dynamic content, and of course back-links. As is always the case, 50% of the success is achieved in constructing the website. The other 50% is in maintaining it. This, the site had to also be built in a way that would allow the back-end users to achieve this. CMS: this was a vital element of the site, in order to offer visitors ongoing dynamic content and information on the HABC's core services, as well as regularly updated information on the HABC, i.e. news, events, members. In doing so, content would also benefit SEO in the long term. The CMS had to be fully customised, simple, user-friendly (for the client to easily maintain in the backend) and functional. 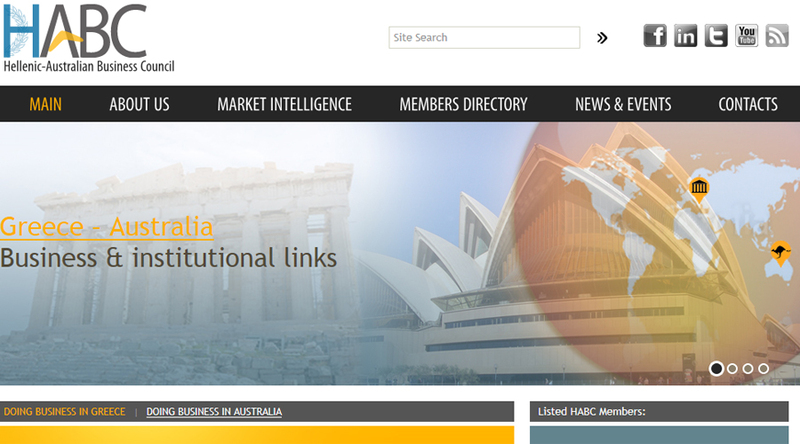 Hellenic Australian Business Council member directory listings. Hellenic Australian Business Council news, for regular updates on major announcements and press releases, with photos, videos and sharing via social media. This helps generate traffic back to the website, greater exposure and overall interest in the organisation and its services. Hellenic Australian Business Council events, for information current members and other new interests on upcoming and past events and missions. Investment opportunities for uploading detailed information, documents, image and videos for each the Greek and Australian markets.